If you are doing a job where outlets aren't handy and extension cords could pose a safety hazard, then a cordless drill may be just the tool you are looking for. 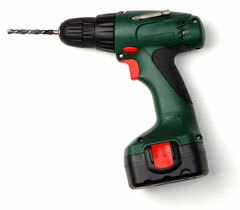 Cordless drills can be used for most light and medium duty drilling and screwing jobs. A cordless drill is similar to a corded drill, in that a switch on the drill handle turns the drill on and controls its rotational speed. Another switch allows you to reverse the drill's direction. Most cordless drills also have keyless chucks. Cordless drills do have a few features that corded drills do not, including a two-speed transmission that lets the chuck turn at a low speed for drilling large holes, or at a high speed for drilling small holes. The gears are shifted via a lever on the top of the drill. Another feature the cordless drill has that its corded cousin doesn't is a variable clutch that tells the motor to disengage when it meets resistance. This prevents screws from being damaged or over-tightened. While cordless drills are great for everyday use, they may not have the capability for heavy-duty jobs. Many do not have the torque to drill large holes, or quickly run out of battery juice when attempting to do so. Both nickel cadmium and nickel metal hydride battery systems are used in cordless drills. The batteries will have different power ratings; usually, the higher the battery rating, the more expensive the drill. A 12-volt drill is a good choice for most jobs, while an 18-volt drill is a good choice if you plan to drill a lot of large holes. 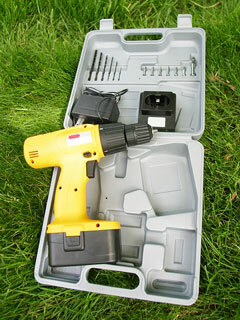 Some pro-quality cordless drill models feature long-running Lithium-ion battery packs. Before you buy a cordless drill, handle several to determine which is the most comfortable. You may also want to determine which accessories are available for any drill you consider. The United States Occupational Safety and Health Administration (OSHA) offers these guidelines for safe handheld drill operation. Power Tool - guide to portable and stationary power tools.